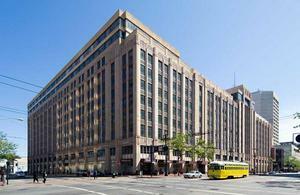 The Twitter building at 1355 Market Street. Photo courtesy San Francisco Business Times. We noticed some ABC license activity, and Inside Scoop confirms that Bill Russell-Shapiro and his partners at the Absinthe Group are opening a spot in 888 Brannan, down in SoMa. The space is 5,400 square feet, and will have a full liquor license and a substantial bar. To serve the tech offices in the building, they’ll offer coffee and breakfast in the lobby (lunch and dinner will be in the main dining room), plus you’ll find outdoor seating and a private dining room. Opening is slated for summer 2014. 888 Brannan St. at 8th St.
San Francisco Business Times reports that the newest tenant to sign onto the Twitter building on Market is none other than the long-lost ~CADILLAC BAR AND GRILL~. The Cadillac was a notoriously “raucous” hangout for journalists until it was demolished in the 1980s to make room for the Moscone Center; apparently, partner Mike Rodriguez plans to reopen the old haunt in a new location. Details are scarce at the moment; we’ll update when we hear more (and when the deal is final).1355 Market St. at 9th St.